On the 15th (Fri), trek along Lost Mine Trail and then take your sightseeing to a higher altitude at Chisos Mountains. Get ready for a full day of sightseeing on the next day: explore the striking landscape of Big Bend National Park. For more things to do, photos, other places to visit, and tourist information, go to the Big Bend National Park tour itinerary planning tool . Corpus Christi to Big Bend National Park is an approximately 10.5-hour combination of flight and car. You can also drive. Traveling from Corpus Christi in February, expect little chillier with lows of 46°F in Big Bend National Park. Wrap up your sightseeing on the 16th (Sat) to allow time to travel to Corpus Christi. A gulf coast town with a semi-tropical climate, Corpus Christi serves as a getaway destination with a life of its own. 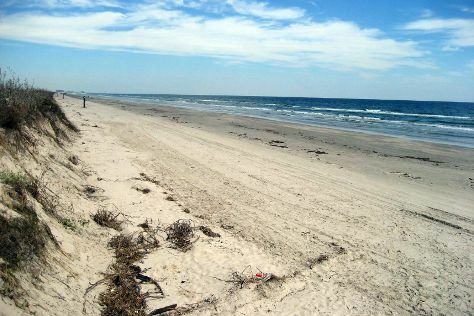 Relax by the water at Port Aransas Beach and Michael J. Ellis Beach & Seawall. Explore the numerous day-trip ideas around Corpus Christi: Leonabelle Turnbull Birding Center (in Port Aransas) and Rockport (Goose Island State Park & Rockport Beach). There's lots more to do: kick back and relax at Padre Island National Seashore, stroll through North Beach, meet the residents at Texas State Aquarium, and take in the views from Corpus Christi Harbor Bridge. Use Inspirock's suggestions to plan your Corpus Christi trip and find the best activities and attractions for your vacation. Traveling by combination of car and flight from Big Bend National Park to Corpus Christi takes 10.5 hours. Alternatively, you can drive. Expect a bit warmer evenings in Corpus Christi when traveling from Big Bend National Park in February, with lows around 53°F. Wrap up your sightseeing on the 23rd (Sat) early enough to travel back home.